Repositionable toys include a soft hanging monkey, a soft toucan with jingle, an elephant with soft ears and a spinner with beads, a parrot with a paddle spinner and a frog character mirror. Two satin butterflies fly around above baby as colored lights pulse on and off while music plays. The large mat has a quilted rainforest underside, sun ray ribbons, and a soft tiger tail. A large soft giraffe sits at the bottom of the rainbow arch and has two points on which to link toys for baby. Mom can also link the toys to any of three link points on the mat as well as to any of five link points overhead for a total of 11 places to link toys for baby. Mom can choose between three modes of play: Baby mode allows baby's play time movements to set off eight to 12 seconds of lights and music. Music mode plays music for 20 minutes while baby plays. Rainforest mode plays 20 minutes of rainforest sounds while baby plays. The gym provides four songs and two sound effects sequences. Requires 2-C batteries, not included. Gym measures 20" x 32.5" x 32.5". 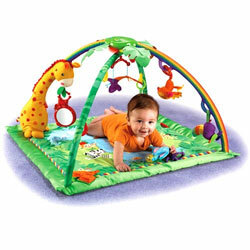 Bring the exciting world of the rainforest to life with the Fisher-Price Rainforest Melodies & Lights Deluxe Gym. This fun, interactive, and educational activity centers encourages healthy development while entertaining and calming baby. Designed for use from birth on up, and requiring two "C" batteries (not included), the gym has a soft quilt and offers music, lights, and nature sounds to keep baby safely occupied. Tummy-time play with five linkable toys that can be reposition for your baby. View larger. This bright and cheery activity center features a quilt with a silky border and colorful arches supported by an adorable giraffe. 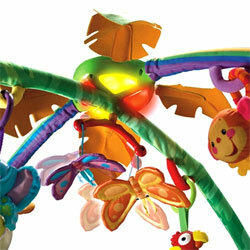 A variety of links let you attach toys up above or down below to capture baby's attention. A cushy monkey, jingly toucan, cute elephant, and parrot with spinning paddle invite baby to bat them around, an action that helps develop gross motor skills. You can also place baby on her stomach for some back-strengthening "tummy time." 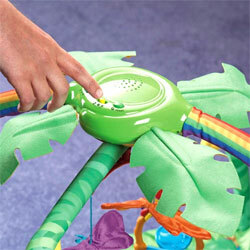 For added excitement, there's a spinner with rattling beads, spinning butterflies, a shiny mirror, and a crinkly leaf. To suit baby's mood, this gym offers three modes of play. In the first mode, baby's movements set off eight to 12 seconds of lights and music, which helps teach your child about the relationship between cause and effect. Another option is the music mode, which develops baby's auditory sense with 20 minutes of continuous music. Finally, the rainforest mode plays 20 continuous minutes of rainforest sounds while baby plays or simply relaxes--don't be surprised if he's soothed right off to dreamland! This activity center measures 20 x 32.5 x 32.5 inches (WxHxD) and weighs 4.7 pounds. Quilt, arches, and a variety of hanging toys with links. Plays up to 20 minutes of music or rainforest sounds for baby. View larger. Satin butterflies spin at baby's touch, activating lights, music or sounds. View larger.